When you apply vehicle lettering and graphics to your cars, trucks and trailers, you create a traveling billboard that promotes your business with every mile it travels. JLC Signs & Graphic Works has been providing visual communication for the Gillette & Northeastern Wyoming community for over 30 years. With proven techniques and expertise, we are impacting the world with high quality products and service with fast, friendly and trustworthy service. Custom banners and custom vinyl are an affordable and flexible signage option. Whether it’s for trade shows, product launches, special events or even street pole displays, custom banners can create a powerful signage program in ways that many other types of signs simply can’t match. Call us today, and lets get your project started. Information coming soon! Thank you for your understanding as we continue to develop our website. 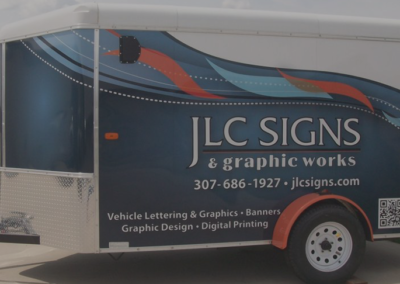 JLC Signs & graphic works delivers the highest quality in large scale and custom printing. Digital printing is the state of the art with vibrant colors and detailed graphics. If you started with a penny and doubled your money every day, it would take you 27 days to be a millionaire. During you lifetime, you will produce enough saliva to fill two swimming pools. 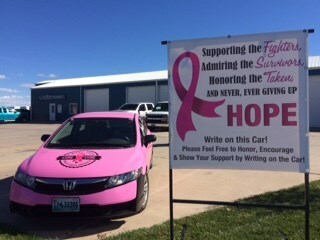 Call today 307.686.1927 or fill out our contact form and someone will be in touch with you shortly.